The Lunar New Year or Chinese New Year is a Chinese festival that marks the beginning of the new year on the lunar calendar. The day is celebrated by almost all East Asian cultures on the same day. There are elaborate parades, feasts, and lots of street festivals. You can participate in the festivities in many places around New York City. Lunar New Year celebrations are grand spectacles that include parade floats, lion dancers, acrobats, and martial artists. It's traditional to light firecrackers; it's a symbol of cleansing the land and welcoming spring. It marks a new growth cycle. New York City is home to the highest concentration of Chinese people in the Western Hemisphere. In Manhattan's Chinatown alone, there is an estimated population of 100,000 people in two square miles. It is one of the oldest Chinese communities in the United States. Korean, Japanese, Vietnamese, and Mongolian ethnicities also celebrate the Lunar New Year. Many representatives living in New York City throw festivities as well. The Firecracker Ceremony and Cultural Festival takes place in Manhattan's Chinatown. It's located at Roosevelt Park between Grand and Hester streets. It's such an important tradition local politicians and community leaders attend. On a large stage there are performances all day by traditional and contemporary Asian-American singers and dancers. Dance groups masked as lions, dragons, and unicorns march through Chinatown's main streets including Mott Street, the Bowery, East Broadway, Bayard Street, Elizabeth Street, and Pell Street. And of course there are firework displays to ward off evil spirits for the new year. 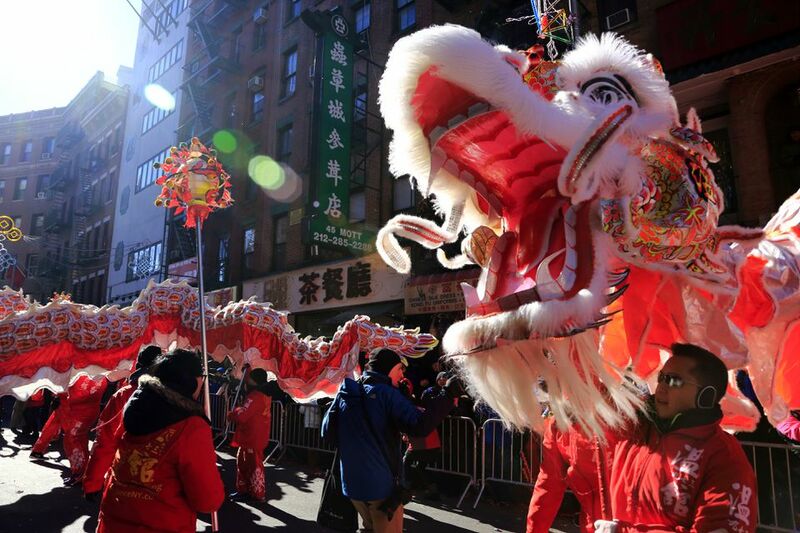 Held on a different day than the Firecracker Ceremony and Cultural Festival, the Annual Chinatown Lunar New Year Parade begins at Mott and Hester streets, winds throughout Chinatown down Mott, along East Broadway, up Eldridge Street to Forsyth Street. The spectacle features elaborate floats, marching bands, and lion and dragon dances galore. Asian musicians, magicians, acrobats, and local leaders also participate. In total more than 5,000 people participate in the parade. The parade usually concludes at 3 p.m in Roosevelt Park. Then an outdoor cultural festival begins with more musicians, dancers, and martial artists. The China Institute is a bicultural, non-profit organization in Manhattan that promotes Chinese heritage. The organization hosts an annual dinner celebration in honor of the Lunar New Year. Proceeds from the event benefit the organization's education programs. Regional customs and traditions vary widely when it comes to the Chinese New Year. It is common for Chinese families to gather together at dinner the night before the Chinese New Year. Many families also thoroughly clean their house to sweep away ill-fortune and make space for incoming good luck. Windows and doors are decorated with red paper cut-outs the color of good fortune, happiness, wealth, and longevity.